The EZCube is an easy way to take great product photographs for the web or print. The photography package is available to any Clayfolk member. It can be rented for one week at a time for $10 plus a $50 deposit (2 separate checks please!). It may be reserved in advance for a particular week. 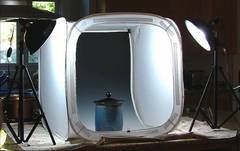 Black to White Vinyl Backdrop is delicate and must be protected from bending, folding, scratching, and marks of any kind that could show in a photograph. The $50 deposit will be not be returned if backdrop is marked. To learn more about the EZCube you can visit their webpage or to reserve the EZCube you can contact Michael McKinney by email.